And here’s to many more journeys! Air New Zealand have a pretty good reputation as an airline, and it’s not hard to see why. 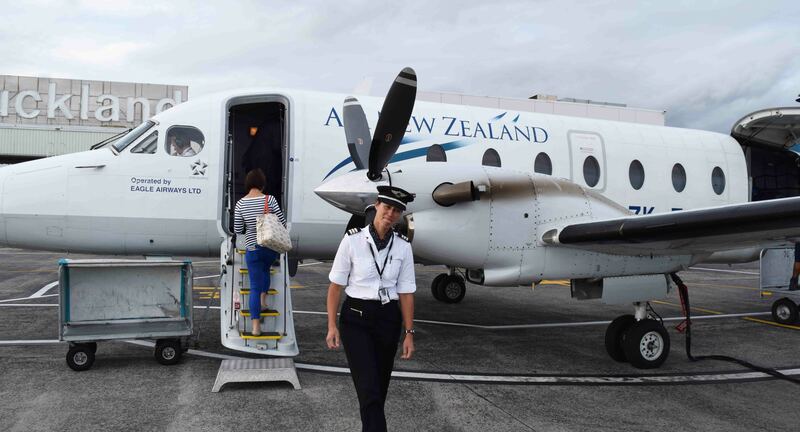 I recently took Air New Zealand from Sydney, via Auckland, to Rotorua. 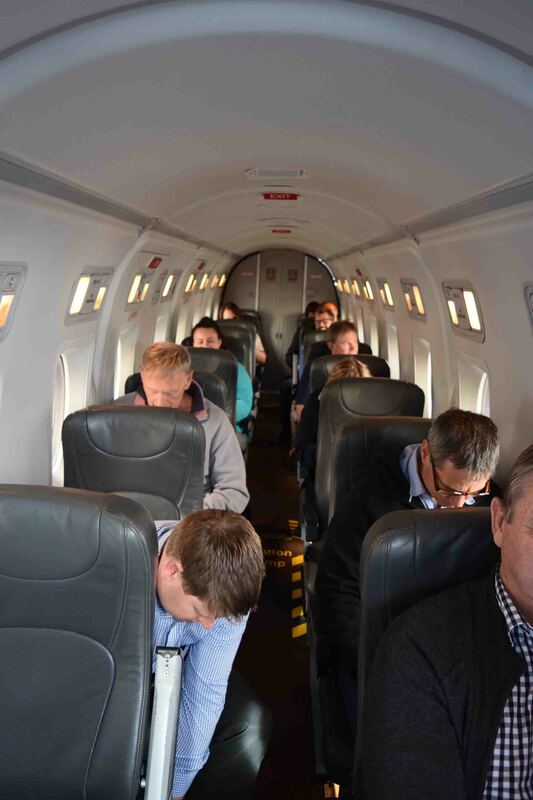 I took a Boeing from Sydney and a Beech 1900 on the second leg. What can I tell you about the experience? Well, last week I had a bit of a rant about Sydney Airport. The check in at Air New Zealand was completely electronic which wasn’t great, but the staff were friendly and helpful when we had a bit of a passport issue, and that was resolved quickly enough. The immigration took ages but that’s nothing to do with Air New Zealand. The Boeing was clean inside and the seats interestingly decked out in black. One thing Air New Zealand have become famous for is their flight safety video, and for sure it’s rather cleverly done and humorous, which is not something one can usually say about safety videos. Flight departure was on time, and the flight was smooth enough, and there was a full entertainment system on board which was great. Plenty of legroom too, more than Qantas a few days earlier. Air New Zealand are essentially a full service airline, however you do need to select it when buying the ticket. We took tickets with ‘The Works’, including meal and checked baggage. The price difference wasn’t huge, $50 maybe less. I think it was well worth it. They rate as one of the world’s best airlines – a survey I read late last year had them at number 11, so you know it’s going to be decent. Great safety record, friendly and helpful staff who are good at their jobs. 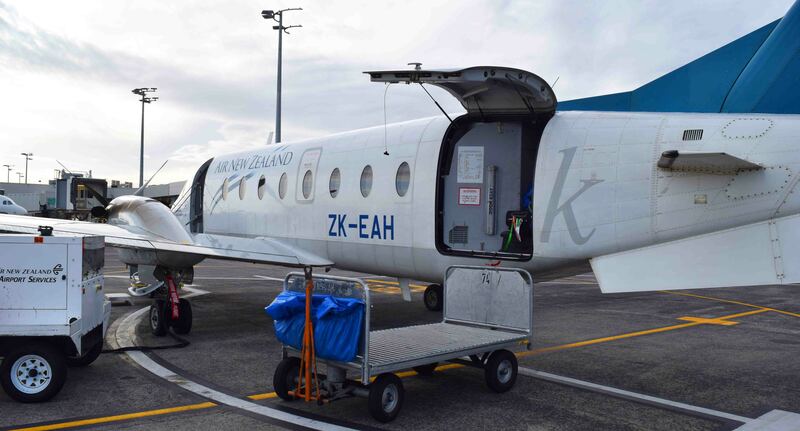 The only negative was when arriving in Auckland the plane ever so slightly overshot the air-bridge and had to back up. Doesn’t sound like much but it required them to get permission to reverse a couple of metres and it took time. I was worried about the transfer at Auckland, we had less than two hours. We had to clear immigration and get bags and then take the shuttle bus to the domestic terminal and check the bags in again. As it turned out, we did it with plenty of time to spare, it was all rather quick. But this sort of thing stresses me if I’ve never done it before. When we entered the domestic terminal we place our bags on a conveyor belt and they magically found their way to the correct plane! 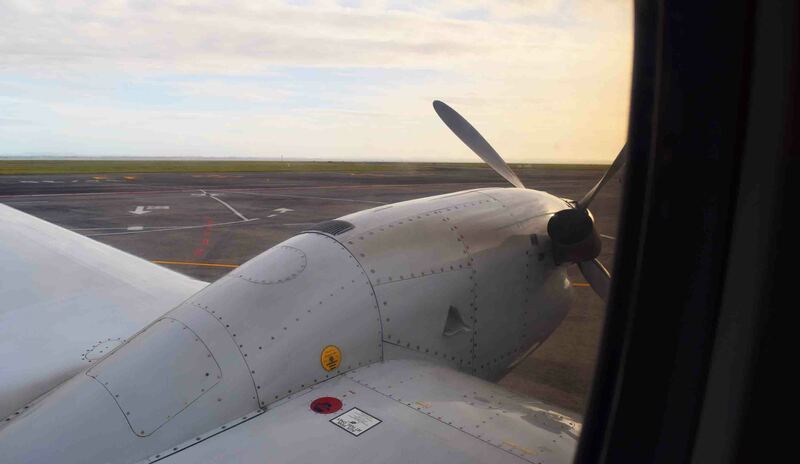 The Beech 1900 was a special little plane, with propellers whirring and ready to go. We waited in the terminal before being called through the one door and walking across the tarmac to the plane. They told me to put my camera away on the tarmac, but I managed to get a couple of photos before I did. 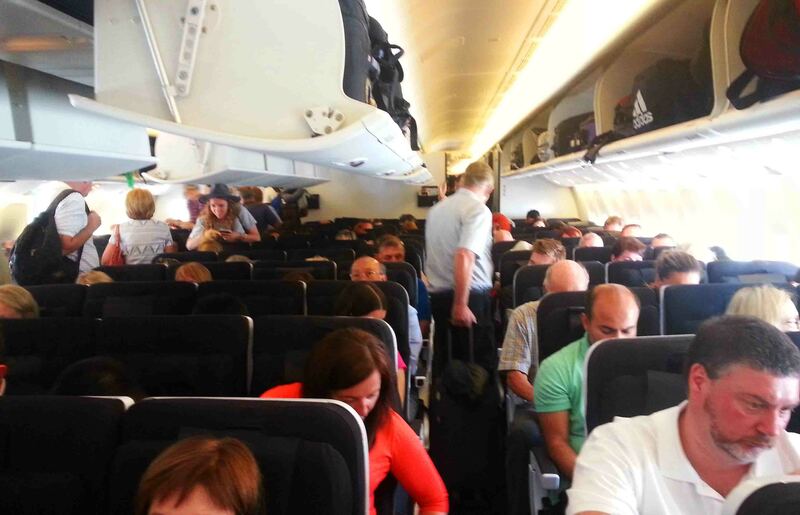 The plane held – well I’m not totally sure but it was probably about 16 – 20 passengers and we were full. One seat, aisle, one seat configuration. 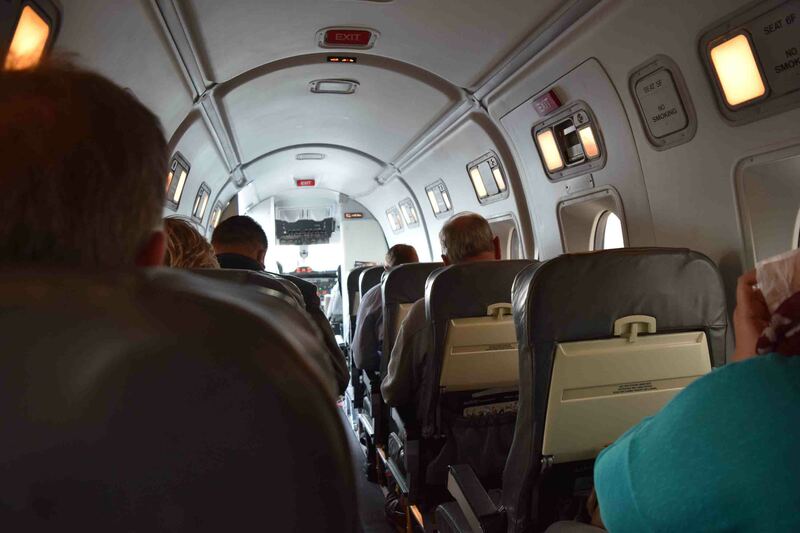 The flight was around 30 minutes and no service or entertainment of any kind was provided – and one wouldn’t expect there to be. To be honest I was pretty nervous before and during take-off. Having said that, once we were up in the air I was relaxed. I could see both the east and west coast of New Zealand outside the windows of each side of the plane. It was beautiful to be up there in such a small craft. No real turbulence to speak of, the flight was smooth and I even fell asleep for ten minutes. Touch down in the little airport of Rotorua, the bags arrived quickly and we were done. Air New Zealand provided a hassle free day where the only stresses were in my own mind. I would happily recommend them to anyone flying routes they provide. May the Journey Never End!